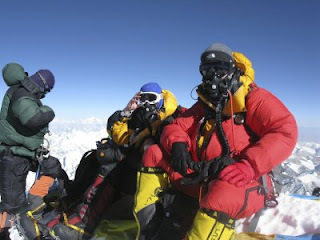 Climbing Everest involves a lot of walking up and down the mountain to acclimatise to the altitude. You inch up, camp by camp, back and forth, until you adjust. Then, when you’re within sight of the summit at Camp Three, you head all the way back down, past Base Camp, to relax, build up your strength for the final climb and wait for good weather. Goodland found this frustrating. “This way of climbing, the way [Edmund] Hillary did it, doesn’t suit most people. Altitude saps your strength, but acclimatisation makes the climb gradually easier. At some point, the two cross – ideally at the summit. But his favourite moment was on summit day, just before dawn. His group set off for the top in the dark. “When the sun rose, over Tibet, you could actually see the curvature of the earth. Sunrise also meant we were nearly there."